Halpern Architects routinely explores alternative forms of construction with the idea of offering our clients a broader range of options and cost-effective approaches to construction. One recent approach that we investiated with a local modular construction company was the development of several custom modular homes. 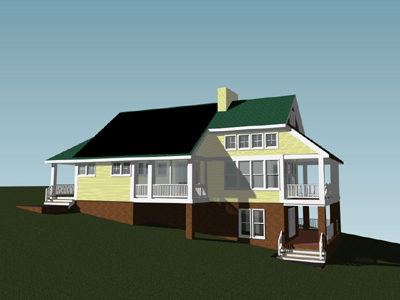 This particular home was designed for a rural steeply sloping site in Carroll County. This 1,400 square foot house was developed around the client’s specific wish list, site constraints, tastes and long range objectives, and was optimized for modular construction. 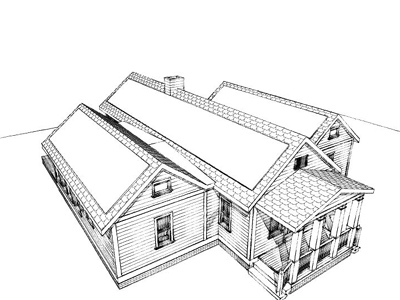 The design was intentionally designed and oriented to permit the installation of roof top mounted photovoltaic solar panels (shown), as well as a second portion of the roof intended for solar water heating panels (not shown). 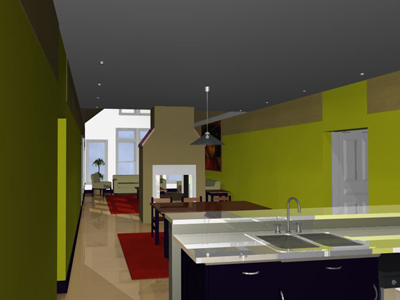 For most of the month of September, 2011, Halpern Architects was devoted to producing a new home design for the TV show Extreme Makeover: Home Edition. This Extreme Makeover Home brings to fruition many of the goals of a year-long collaboration between Halpern Architects a local contractor focues on green modular construction. In preparation for the charrette that produced the design, Halpern Architects and the rest of the design team received a video from EMHE that introduced the family. We were permitted a brief site visit. 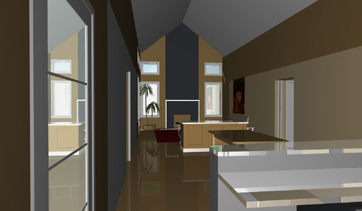 As a result, the team concluded that the design would be a 2,000 square foot, four-bedroom, two-bath home. The goal was to keep the volume of the house small so that heating and cooling loads could be kept to a minimum. This meant that room sizes were compact, but comfortable; circulation was minimized. The roofs were oriented to maximize clear sky exposure, and orientation was optimized to allow a sufficient number of photovoltaic solar panels to allow the house to produce as much electricity as it used, if not more. Siding systems and other construction components were chosen for low maintenance and low carbon footprint, as well as speed and ease of installation. The modular aspect of the project allowed a higher quality control level and minimal waste, and allowed construction to begin before the “Door Knock”, that emblematic moment when a family finds out that they have been selected for the show. The new home is 2,700 square feet, with inviting and spatially interesting interior spaces. It is oriented to maximize available sunlight on the PV solar panel arrays. It should be efficient to heat and cool and easy to maintain. 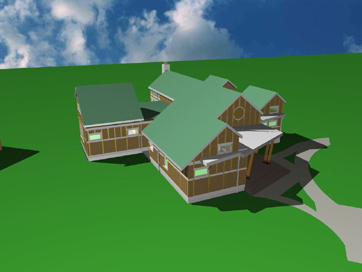 In an effort to explore the use of modular construction to produce a more verdant home design, Halpern Architects decided to produce a ‘prototype modular green home’, which we saw as a chance to explore strategies to optimize a home for modular construction, affordability, low maintenance construction and reduced operating costs. The design brief started with a focus on keeping the house compact while creating an interesting exterior and interior spaces that are inviting and spatially pleasing. 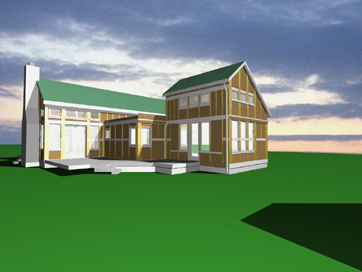 The prototype design is a three-bedroom, two-bathroom home in less than 2,000 square feet. The floor area and volume of the house was purposefully small so that heating and cooling loads could be kept to a minimum. This meant that room sizes were intentionally a balance of being compact yet comfortable. Circulation was minimized. The roofs were oriented to maximize ‘clear sky’ and the orientation optimized to permit a sufficient number of photovoltaic solar panels to create a house that produced as much, or perhaps even more electricity than it actually used. Siding systems and other construction components were chosen for low maintenance and low carbon footprint, as well as speed and ease of installation. 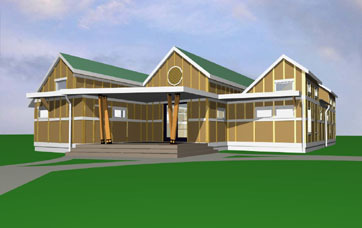 The modular aspect of the project allowed a higher quality control level, waste to be minimized, and allowed construction to begin before the site work began, minimizing the period that the owner was paying a construction loan on a home that could not yet be occupied, as well as the period when the site was disturbed for environmental reasons.